NOTE : Activation key must be used on a valid Steam account. 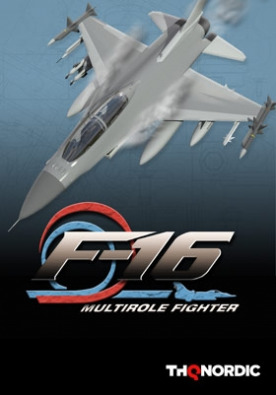 Requires internet connection.ABOUT THE GAME	With innovative technologies such as fly-by-wire controls, sophisticated systems for night and all-weather operations and the ability to carry a variety of weapons, the F-16 continually proves to be the workhorse of the USAF. Victorious in all of its air-to-air engagements, the awesome reputati… on of the F-16 is undisputed. KEY FEATURES Authentic Lockheed Martin approved flight model and avionics	Flight tested by Lockheed Martin F-16 Chief Test Pilot, John Fergione Get airborne and begin combat in minutes	Fast 3Dfx™ support, up to 1024 x 768 with Voodoo2™ [Incredible with SLI]	Fully interactive 3D virtual cockpit accurately reflects the F-16's current conditions and can be viewed at any time	40 single player missions plus 12 multiplayer missions - 6 deathmatch and 6 A.W. (Air War) cooperative missions Mission design tool to create your own scenarios and share them with friends Use F-16's LANTIRN for night vision and precision bombings	6 degrees of freedom graphics system for unrestricted views of the action FREE Large-scale Internet play via NovaWorld — go head-to-head with over 120 F-16 Multirole Fighters, MiG-29 Fulcrums and F-22 Raptors in one arena SYSTEM REQUIREMENTS OS: Windows 2000, XP Processor: Pentium 266MHz or better Memory: 32MB minimum Graphics: Direct3D compliant Hard Drive: 395MB Free Sound: DirectX compliant ©1998 NovaLogic, Inc. NovaLogic and the NovaLogic logo are registered trademarks and NovaWorld, the NovaWorld logo, Integrated Battle Space and Fulcrum are trademarks of NovaLogic, Inc. Lockheed Martin, the Lockheed Martin star logo and F-16 Multirole Fighter are trademarks of the Lockheed Martin Corporation and are used under license to NovaLogic, Inc. All other trademarks and logos are property of their respective owners.